Once in a great while, a poet has the chance to meet with someone who has “been there, done that” many times over. Such was the case over my recent spring break. My family and I had gone to north Georgia to visit my dad’s sheep farm and do the tourist routine. 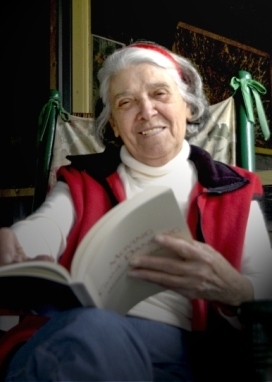 While there, my father suggested we visit with local writing legend Mildred Greear. I must admit, I was hesitant about the engagement. Stopping by the home of an 87-year-old woman wasn’t really on my itinerary amid mini-golfing, mountain climbing, and snowball fights, but I figured, what the heck — vacation means no real schedule, and who knew? It might turn out a piece of writing or two. As it turned out, Mildred’s home wasn’t too far away from where we were staying; just “up the hill,” to be exact. My father and I arrived and were greeted at the door. Mildred offered to put on some coffee for us, but we had just gone by the Sweetwater Coffeehouse and were good to go, we replied. So we sat down at her big dining table and began to talk literature. Mildred was especially interested in my literary endeavors, and asked if I’d ever submitted to the Atlanta Review, in particular. I told her I’d sent them a few pieces many years ago (pre-undergrad, let alone MFA), and she encouraged me to submit again. So far, I’d gotten pieces of valuable advice for both of my fields of expertise: writing and teaching. But she wasn’t done yet. The next lessons were the best of all, as they dealt with literary life in general. Like me, Mildred self-published some years ago, and was disconcerted by the work’s treatment by others in the poetry and book community. “They’ll say, ‘it’s not a real book,'” she recalled, “but you and I know different. Our books are better than a lot of that stuff (traditional publishers) publish.” She looked over a poem of mine from my first volume, Growing Moon, Growing Soil: Poems of my Native Land, and gave it both praise and refinement. “These words — isolation and anticipation — they throw me off a little,” she stated candidly. “Everything else is so peaceful and beautiful, and these words are jarring, kind of out-of-place.” She made me wish I’d met her before I went to press with that first volume back in 2005. Even at 87, her editorial eye hadn’t faded a bit. She spent a little time recalling her science professor husband Phillip, bragging on his groundbreaking work regarding walnuts and other topics. Her pride shone behind a great smile as she thought of walnut trees returning all over the nation, largely because of Phillip’s influence and experiments. Modern scientists use much of his research even today in modern laboratories, she bragged. Yellowed articles about Prof. Greear’s work were pinned to her wall nearby, lasting reminders of an academic life well-lived. The memory of that night still haunts Mildred Greear. A pair of boys, Reese’s pupils, had stopped by minutes before his death, and Byron was playing a sad song on the Victrola in his office, the story goes. He seemed very depressed, and the students attempted to cheer him up before heading out. As they proceeded down the hallway, they allegedly heard Reese’s fatal gunshot. The boys ran back to find their good professor dead. Mildred said she encountered one of the young men years later and asked him if he was one of the students who visited Reese that infamous evening. The gentleman she inquired of, now a full-fledged adult, said he was indeed. They consoled one another all over again, remembering Reese’s spirit and work. Mildred, my dad and I talked a little longer, mostly small, innocuous chit-chat, and then she completed our visit with a hearty thank-you to both of us for stopping by. She wished me well, and implored me to keep in touch. She also asked for a copy of my book, which I’ll be sending soon. Mildred, like so many other elder writers, offered me a keen sense of what value can be added to a life by simply “sticking around.” Her history, her perspectives, and her sound sense of good writing made our visit not only an unexpected pleasure, but a real privilege as well. Thank you, Mildred.